We create hot-off-the-press content daily at N2 Publishing: custom-designed publications full of beautiful family photos and stories of achievement, sacrifice, and legacy. But this time, what’s “hot off the press” is an exciting announcement: We are on Inc. 5000’s list of the fastest-growing private companies in the nation for the eighth year in a row!! This honor is certainly something we don’t expect to be handed to us after all these years. In fact, making the list gets harder every year as our revenue grows. Now, sitting at $137M in revenue, it’s a lot harder to double or triple our growth than it was when we were at $10M. But we are beyond thrilled to have made this prestigious list for eight consecutive years – an achievement that puts N2 in the top 4% of most-tenured companies on the Inc. 5000 list. Fourteen years ago, two friends chased a big dream: to build financially-rewarding careers without sacrificing time with their families, and to then share that opportunity with others who wanted the same. N2 Publishing is the company that emerged from that dream – and our growth year after year only allows us to continue chasing that goal. Of course, our product is an integral part to N2’s success. This is what generates revenue and allows us to be, well, a profitable business. And, these beautifully-designed publications turn neighborhoods into communities and connect residents with local businesses. But our publications are still not our real “why” – they’re simply the vessel we use to get there. The “why” behind our company is, simply put, our people. We believe in finding great people and pouring into their professional and personal growth instead of gilding the front lobby and buying unnecessary fancy décor. We believe the most important legacy a company can leave is not necessarily its product, but the way it treats people. And we believe that people, if taken care of, can create a great and enduring company. 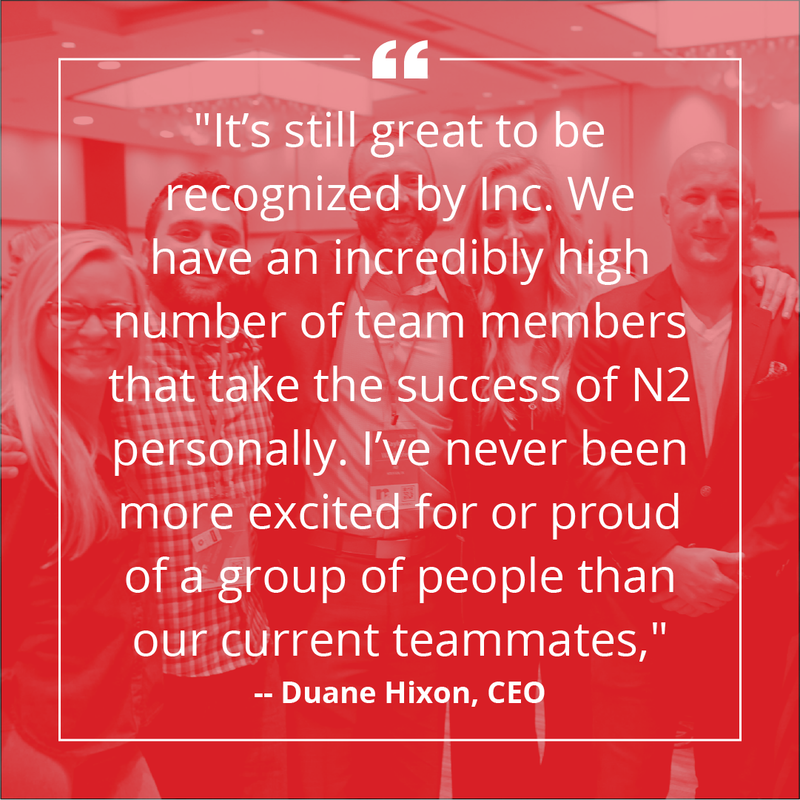 "It’s still great to be recognized by Inc.,” says our CEO, Duane Hixon. “We have an incredibly high number of team members that take the success of N2 personally. I’ve never been more excited for or proud of a group of people than our current teammates." So it’s because of our people that we are able to keep this streak alive. And we’re going to throw all the confetti and celebrate another big win!